It’s extraordinary to think that it’s the eleventh anniversary of Padstow Christmas Festival. Looking back to the first one in the Seaman’s Mission and Padstow Institute, with just one or two demonstrations, to what it is now with two enormous marquees on the quayside and demonstrations by chefs from across the country, it really is a testament to the popularity of the event. Padstow is decorated with Christmas lights, and there’s lots of lovely pubs and restaurants to enjoy. It’s the place you’d really want to be on a weekend in December. The festival is one of those events where everyone seems to be in a thoroughly good mood, probably because there’s so much great food and drink on offer. The harbour seems to come alive and is a perfect venue for the four-day Christmas party. Every year, the festival seems a little larger – last year, we attracted around 50,000 visitors. But don’t worry, it’s never going to get too big; it’s the small scale of it which makes it so special. It’s hard to believe that it’s 11 years since the first Padstow Christmas Festival. It seems like it was only yesterday when I was doing a demo in front of about 15 people at the social club! When people ask me what the festival’s like and whether it’s worth a visit, my advice is always the same: just do it. The festival never disappoints. It’s a magical winter wonderland and, for me, feels like the official start to Christmas. It’s a great way to learn from an impressive cast list of some of the best chefs in the country, and to start stocking up on the huge selection of produce from incredible artisan stalls in the Christmas market. It’s so important to remember, though, that the festival would be a pipe dream if it wasn’t for the wonderful volunteers who give up so much of their time to make it happen. Without a doubt, summer 2018 was a scorcher, but I think my favourite time in Padstow is during the Christmas festival. Ok, so you probably can’t sunbathe, but you can sample some wonderful food and drink, and all in time for Christmas! Now in its 11th year, the festival goes from strength to strength, and you’re sure to find something of interest. As well as food and drink, there are craft stalls offering unique gifts – and you can get in the festive mood enjoying the various singers and entertainers who will be performing around the town. 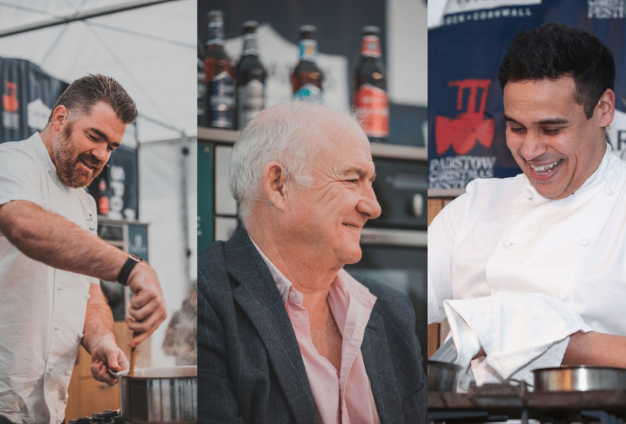 As well as all that, to give you some inspiration, a selection of the very best chefs in the country will be taking to the stage to show you how to cook dishes to delight your friends and family. So relax, soak up the festive atmosphere, and enjoy!